13 year old Olivia was already volunteering her weekends to help at the Seaford Down’s Syndrome and Special Needs Support Group Swimming Programme, but decided that she could do even more. Olivia set herself a personal challenge to raise support and sponsorship for the charity. Olivia’s target was to swim 50 kilometres (30.6 miles) over the course of a month. This meant she had to swim 500 lengths each week. With the support of her mum (Helen) and dad (Martin), she visited most of the Wave Leisure Swimming Centres to achieve her goal. Her swimming coach, Alan, Swimming Coach for Lewes Swimming Club supported and encouraged Olivia by keeping track of her progress at each swimming session. 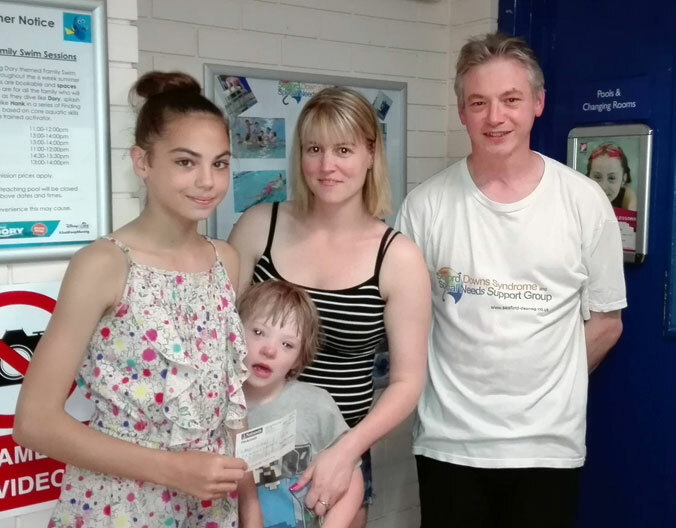 Olivia surprised Michelle Evans (Seaford Down’s Syndrome and Special Needs Support Group’s Swimming Teacher) and Dave Brown (Seaford Down’s Syndrome and Special Needs Support Group’s Co-Chair) at the pool, with a letter explaining her challenge, accompanied by a cheque for £507.70. Olivia, later attended one of the charity’s monthly Family Drop-Ins for a cheque presentation photo and to meet some of the other children the charity supports.